Remember that pilot script I wrote for "Jake Harrison - Relationship Detective"? This year you'll get to read the story in comic book form! 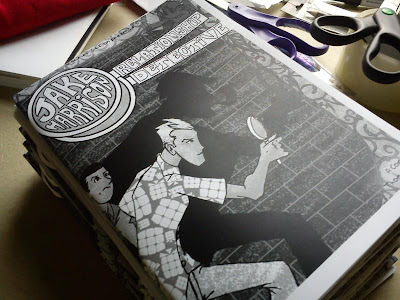 This year's "Xscript Fiction Presents" comic will be Jake Harrison's comic debut! When are you going to get a chance to get it? Melbourne Armageddon Expo 2012! (Details to come). Here's the blurb for the comic. Armed with nothing but his collection of gaudy Hawaiian shirts, Jake Harrison is here to solve the mysteries of the heart. Together with his best friend and reluctant side kick, Hudson. Jake needs to solve a mystery that seems mundane to anyone but him! Murder mysteries have "Holmes". Medical mysteries have "House". Now the crazy little thing called love has Jake Harrison, Relationship Detective!